The PIR2 is only available to existing customers & software developers. Traceability - every PIR2 has a unique serial number. Supports all Maxim/Dallas Semiconductor iButtons. Collects the time and iButton identity for touch events. Secure NV Memory capacity to hold 500 readings. Visual & auditory feedback ensures ease of use. High integrity data - all records contain CRC-16’s. Low power battery lasts for 500,000 reads or 5 years. User replaceable off the shelf battery - CR2032. Compact (3.34” X 1.75” X .75”) ABS (UL 94 HB) Enclosure. Protected against 27kV ESD (IEC 801-2 Reference Model). High speed downloading - up to 142 Kbps. The PIR2 is a low cost handheld data collector well suited for asset tracking, guard tour management, or other similar type tracking applications. The compact PIR2 quickly collects and securely stores time and identity information. This information comes from an internal clock and touched iButtons. There are many types of iButtons, some are used for simple identification, some contain nonvolatile memory, and others incorporate sensors like temperature and humidity. Regardless of type, all iButtons are enclosed in rugged stainless steel cans, have guaranteed unique serial numbers, and communicate using 1-Wire protocol. The PIR2 design leverages these three features. The iButton’s rugged stainless steel cans are small, easily mounted, and have a common outline. This standard form factor allows the PIR2 to make contact and read any of the iButtons. The iButton's guaranteed unique serial number allows it to be used to tag assets, identify people, or mark locations. 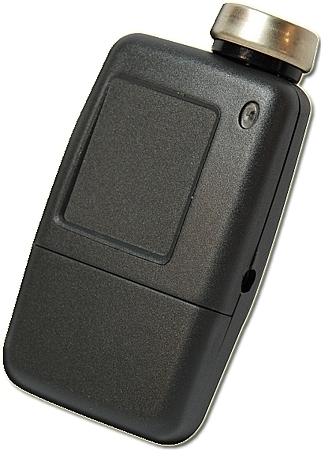 The PIR2 captures the unique serial number of an iButton and records it along with the current time whenever a touch event occurs. Communication with 1-Wire protocol is readily accomplished using minimal hardware. The PIR2 is a low cost low power microprocessor device able to operate off a single coin cell for 5 years. In addition to the modest hardware requirements 1-Wire protocol includes strong error detection. The strong error detection allows 1-Wire networks to deliver reliable communications even under the challenging conditions of temporary intermittent contact. The PIR2 not only uses iButtons externally as data sources, it also uses a DS1996 (64-kbit Memory iButton) internally to securely store the data. The stored data includes the time of the touch event along with the unique serial number of the touched iButton and a CRC-16 to ensure data integrity. The DS1996 contains an internal battery allowing it to provide secure data retention for up to 10 years. To ensure data completeness, feedback is always provided to the operator. There is a visual and audible (a single LED flash and beep) indication every time a record is successfully written (a reading is taken). If the data storage capacity is ever exhausted, the device will flash three times to alert the operator that the data must be downloaded before continuing. For OEMs interested in integrating the PIR2 into their own applications, the SK-PIR2 - PIR2 Development Kit has been developed. In addition to hardware, the kit includes software for Windows based systems. The PIR2Srv software will move the data from PIR2’s onto the Windows PC in an easy to use CSV file format. Additionally the PIR2Srv software manages the PIR2’s internal clock keeping it synchronized with the host PC.